Arg-Antibody Elution Buffer (pH 4.0)｜Products｜nacalai tesque, INC. This product leads to effective elution of antibodies from protein A columns under mild pH (pH 4.0). Normally, antibodies are not effectively eluted at pH 4.0. Use of a lower pH can lead to partial denaturation and subsequent aggregation of the eluted antibodies. This product is based on the unique characteristics of arginine, which suppresses protein-protein interactions. This product is manufactured with permission from Ajinomoto Co., Inc. based on the patent JP 4826995*. Arg-Antibody elution buffer shows much higher recovery (lane 6) than glycine buffer (lane 5). Equilibrate a protein A column with an appropriate buffer. Load a sample expressing antibodies. Wash the column with an appropriate buffer. Elute antibody with 5-10 column volumes of Arg-Antibody Elution Buffer. If necessary, perform virus inactivation taking advantage of enhanced virus inactivation by arginine. Proceed to next step, e.g., additional chromatography or buffer-exchange. Equilibrate an appropriate cation exchange column with acetate buffer. The pH of the acetate buffer should be determined by the pI value of the antibody. Dilute the above eluate with 2-3 volumes of an appropriate acetate buffer. Wash the column with an appropriate acetate buffer. The components of Arg-Antibody Elution Buffer are completely washed out in this process. Elute the antibody using high salt concentration, pH changes, or combination of both. As Arg-Antibody Elution Buffer can effectively weaken protein-protein interactions, there are a few additional applications of this product. Elution of antibodies from Protein-A column by aqueous arginine solutions. 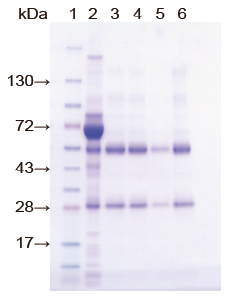 Protein Expression and Purification 36(2), 244-248 (2004). Effective elution of antibodies by arginine and arginine derivatives in affinity column chromatography. Analytical Biochemistry 345(2), 250-257 (2005). Role of arginine in protein refolding, solubilization, and purification. Biotechnology Progress 20(5), 1301-1308 (2004). Screening of effective column rinse solvent for Protein-A chromatography. Protein Expression and Purification 70(2),218-223 (2010). Use promptly after opening. This product is filtered but no preservative is used.